Choosing the best toner cartridge for your laser printer is one of the most important decisions you will make when your goal is to produce a high-quality print. This might seem insignificant at first, but buying a low-quality toner cartridge will not waste your money, but can also ruin the quality you want to achieve in your prints. 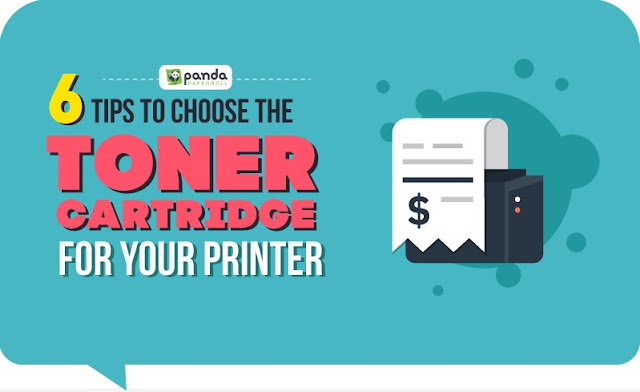 Today, we are sharing an Infographic based on Top Six Useful Tips to Choose the Best Toner Cartridge for Laser Printer. 1. Pick between color or black toner cartridge: If you mostly print text-based documents, then it is wise to choose a black toner cartridge, plus they have a cheaper price. With color cartridges, on the other hand, you can print a wide variety of documents as well as pictures, though they are a little bit more expensive than black toner cartridges. 2. Identify the size of the printer cartridge: You can find this on a sticker located somewhere in the body of your printer. This will ensure that you’ll only get the right toner cartridge perfectly fitted to your printer. 3. Choose between OEM, Compatible, and Remanufactured: OEM are cartridges that are made specifically by the printer’s manufacturer and often has the highest quality. Compatible cartridges are made by third-party manufacturers and can fit a wide selection of printers. Remanufactured are cartridges made from recycled cartridges and is the cheapest among all the options. 4. Know the Page-Yield: This refers to the total number of pages that can be printed with the toner cartridge. Typically, a toner cartridge with high page yield can be a little more expensive than lower ones. 5. Always go for the one with a warranty: Not all cartridges come with a warranty, especially the remanufactured ones. However, when buying a toner cartridge with high page yield, you need to secure a warranty to ensure that it is in a proper working condition and that you will get a replacement item in case you bought a faulty one. 6. Decide whether to buy in bulk or individual cartridges: If you own a printing business, then buying in bulk is the most sensible choice. However, if your purpose is to print reports every now and then, then you should consider buying in packs or individually. To learn more about the best toner cartridge for a laser printer, check out the visual asset below.